I’m not sure if my taste bud has changed but some of the ramen places I once thought were phenomenal have become a bit of a blah. I used to rank Santouka and Mottainai, both located in South Bay, to be two of my favorite ramen restaurants in Los Angeles (Daikokuya is still my undisputed champ), but my recent visits there made me think otherwise. Don’t get me wrong – their ramens are still very decent and in fact, a Japanese TV show recently ranked them in the top 10 ramen shops in LA and Orange County – but I didn’t experience the euphoric high that I once enjoyed after slurping their milky tonkotsu broth. Though never a ramen addict, I do have an occasional craving for the super-high-in-sodium-but-totally-worth-it Japanese comfort food … and it often comes in scorching hot days, like today. Let’s call it a ramen paradox – how a hot noodle soup (in temperature, as well as flavor) tastes extra delicious in a 100-plus degree weather. Determined to recreate the ramen love I once felt, my husband, Pon Pon and I headed to Silverlake Ramen, a small, no-frill establishment in a shopping center on an artsy and very hipster stretch of Sunset Boulevard. This place has received positive reviews on Yelp, and we conquered with the consensus. We ordered the tonkotsu ramen and shared a place of grilled gyoza. I really liked the flavor of the broth and how the “kotteri” (rich) soup intertwined beautifully with the slightly undercooked (just the way I like it) noodles. I think I favor this bowl of pork bone broth over my previous favorite places, but with one caveat. 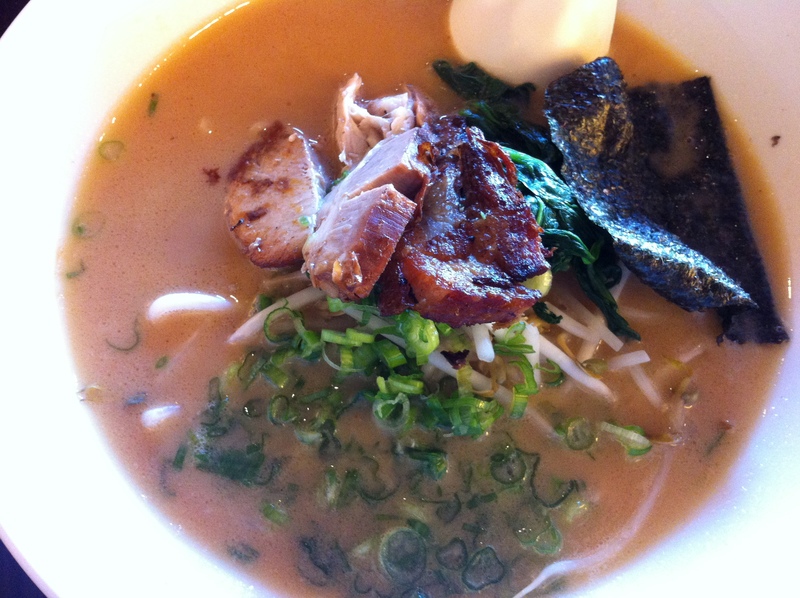 Although flavorful, the broth was way too heavy and thick, like the humid air outside. It was definitely more fatty and salty than I would like, so much so that my palette, as well as my stomach, got too overwhelmed and couldn’t finish the entire bowl. But yes, this place is very good and I would definitely come back here to satisfy my next craving. 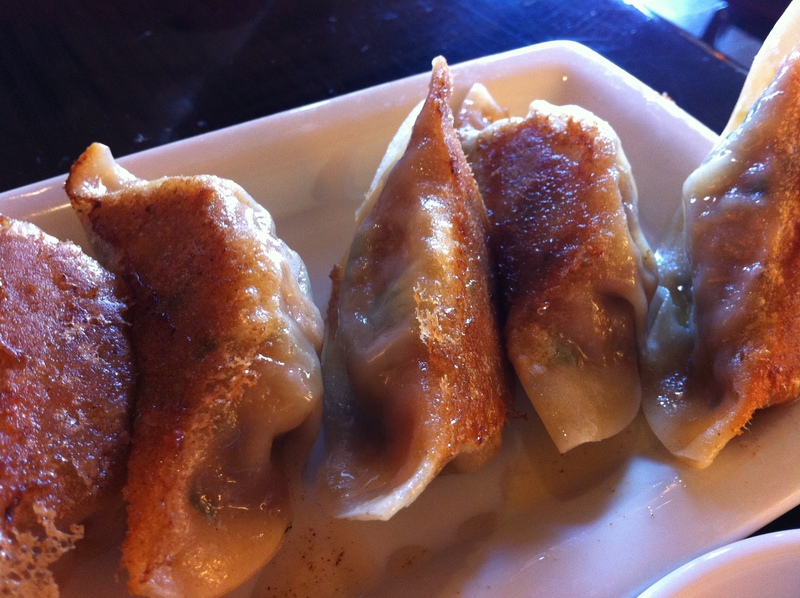 These pork dumplings were very ordinary (and I mean this in an endearing way) but definitely brought out the lovely comfort feel to this gyoza lover here. I’ll be sure to sport a pair of my geeky, black-frame glasses and a skinny jeans next time just so I can blend in with the other Hipsters in this trendy neighborhood.